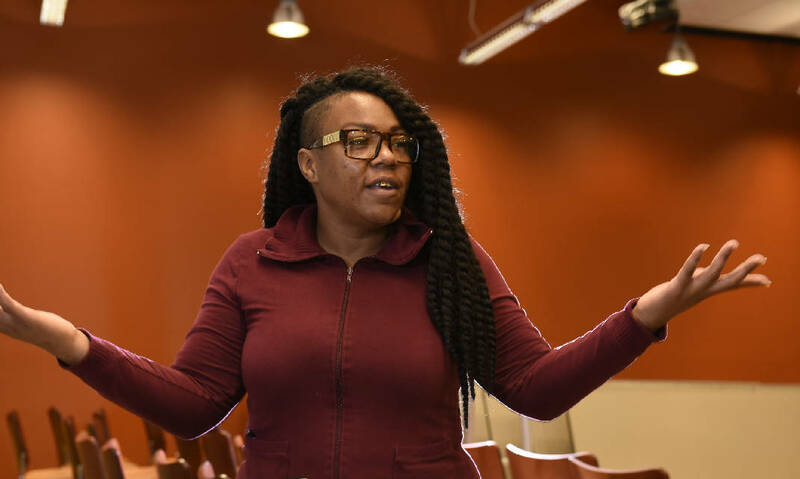 Shameca Burt, photographed Wednesday, Dec. 2, 2015, in Chattanooga, Tenn., was able to relocate her ailing mother from the Patten Towers to an apartment in the Highway 58 era with help from the Neediest Cases fund. Shameca Burt desperately wanted to move her ailing mother out of her bedbug-infested Chattanooga apartment, but she had no money to pay the rental deposit for a new place. Her prayers were answered by a $450 gift from the Times Free Press Neediest Cases Fund that paid for a rental deposit. Burt's mother moved to a better apartment in March. "I still remember her clapping. She was so happy to roll on the porch and see the trees and watch the cars go by," said Burt. Her mother's enjoyment was brief — she died of heart attack in July. But after living with bedbugs for more than a year, Angela Burt Alford, 57, enjoyed the last four months of her life in a pest-free apartment with a private porch, basking in the sunshine. "It was a blessing for me and my mom," said her daughter. Burt and her late mother are among many people Chattanooga Times Free Press readers help when they give to the Neediest Cases Fund. Among other families assisted this year are an 85-year-old woman who went a month without electricity before getting $200 from Neediest Cases to get her power restored and a single mom who used $150 of Neediest Cases money to take her 17-year-old daughter to Nashville for cancer treatments. Readers gave $47,098 to assist more than 300 families in 2014. Chattanooga Times and New York Times owner and publisher Adolph S. Ochs started the fund in the early 1900s after running into a homeless man on Christmas Day in 1911. Ochs gave the man money to find shelter for the night and offered him a job if he visited his office the next day. As a result of that encounter, Ochs started Neediest Cases in New York in December 1912. He started a fund in Chattanooga in 1914. The annual fund drive begins on Thanksgiving Day and continues until the end of the year. Local case workers express gratitude that the fund exists. "A lot of folks have situations come up where they need cash assistance, but none of the resources or grants in our area will cover it," said Gina Turley, a consumer housing specialist with the AIM Center. In Burt's case, she needed funding at the end of a grant cycle when most funds where already spent. But Turley knew she could call the United Way for assistance through Neediest Cases. And unlike some grants, money from Neediest Cases isn't earmarked for a specific purpose, therefore it can help meet various needs. Turley also used Neediest Cases to pay for birth certificates that were needed for families to get in public housing. Other case workers used the funds for transportation to hospitals and for medication. "It's been a real blessing for the people I work with," said Turley.